Materials: : Burlap Weave Silk Fabric in Wheat Gold, Lumiere Copper Metallic Fabric Paint Surface Design, Zipper. Description: A Carol Tate Original Hand Stencil Printed with a Olde World Copper Metallic on a Burlap Weave Silk in a Subtle Hue of Camel/Wheat/Gold. 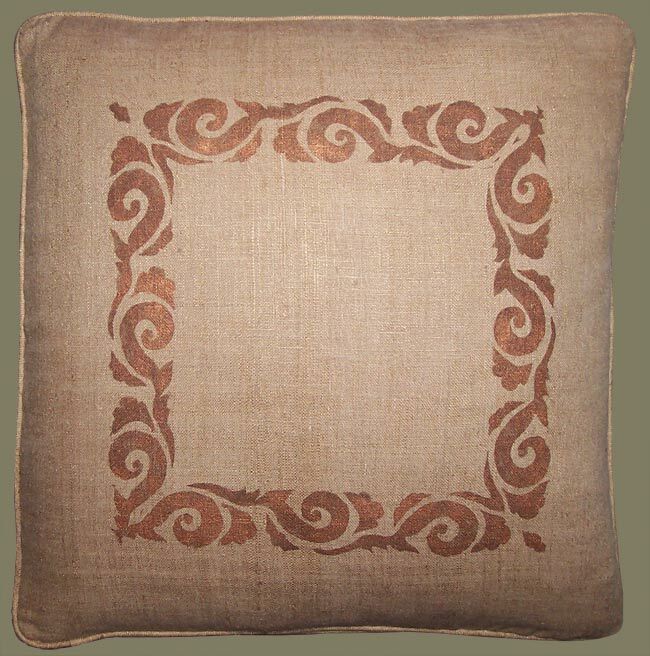 These Artisanaware Pillow Covers are Self Welted with Zippers. The Silk of These Decorative Silk Pillow Covers has been Shrunken for Flavor. Please Inquire About Custom Feather/Down Pillow Inserts.